Is there character count limit with JumboTweet? Jumbo can carry a lot more characters on his back that Twitter still its not infinite. At this young stage, Jumbo can carry around 65,000 characters per JumboTweet. How does Twitter handle JumboTweets? How do I write an auto-destructing tweet? 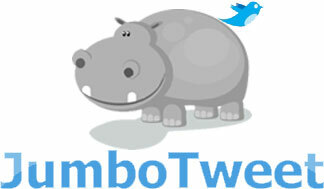 Jumbotweet let's you create an auto-destructing tweet. That means that your tweet will be visible *only once* before auto-destructing!